Macumbeira: Sadko in the Underwater Kingdom by Ilya Repin. 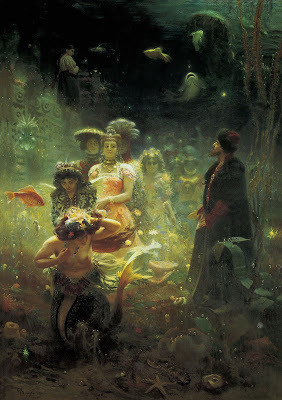 Sadko in the Underwater Kingdom by Ilya Repin. Sadko played the gusli on the shores of a lake. The Sea Tsar enjoyed his music, and offered to help him. Sadko was instructed to make a bet with the local merchants about catching a certain fish in the lake; when he caught it (as provided by the Tsar), the merchants had to pay the wager, making Sadko a rich merchant. Sadko traded on the seas with his new wealth, but did not pay proper respects to the Tsar as per their agreement. The Tsar stopped Sadko's ships in the sea. He and his sailors tried to appease the Sea Tsar with gold, to no avail. Sadko's crew forced him to jump into the sea. There, he played the gusli for the Sea Tsar, who offered him a new bride. On advice, he took the last maiden in a long line, and lay down beside her. He woke up on the shore and rejoined his wife.